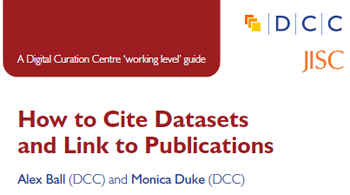 The Digital Curation Centre (DCC) has published another in its series of How- to Guides: ‘How to Cite Datasets and Link to Publications‘ by Alex Ball and Monica Duke of the DCC. It explains how researchers can create links between their publications and the underlying data, so that each can be found from the other. It also provides advice for repository managers and data archivists wishing to make their data holdings easier to cite.